The video poker game appeared comparatively not so long ago, but it had already gained its popularity and became widely played throughout the world. The aim of the game is to get the best poker combination of cards. The key component of the game is its payout table. There exist different tables for various game types, but their principle is the same. 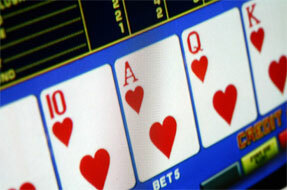 Look through the Jacks or better Video Poker Game Table and below you can read its explanation. 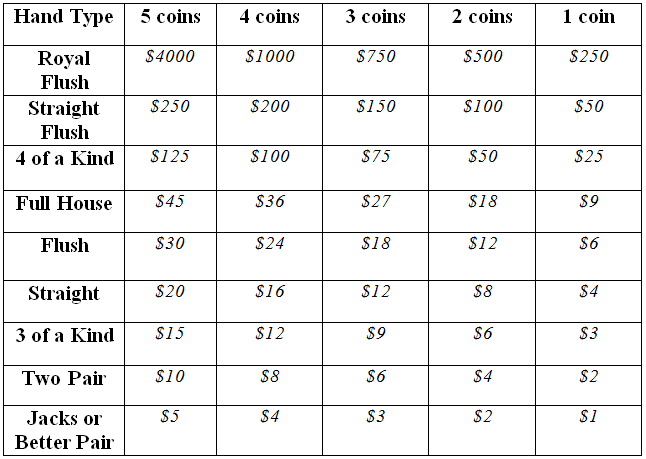 As you can see the pay table has 5 columns, which indicate the coins amount. To find out the sum of winning money the players need to click on the chosen column and the results will be highlighted. You can see that the full house payout is 9:1for the 1 coin wager and 6:1 for the flush. That's why the game itself is called Jacks or Better 9/6 game. All the other variations follow the same logic. The royal flush payout is very high, so this combination is very convenient for the player, but remember that it appears about once per 40 000 hands. We've prepared one more table to you - the comparison one. It matches different video poker versions and their payment percentages. The table can help you to count the expected losses and will hint you on the most suitable game variation. Beware of the deceptive pay tables, as many of them can propose different payout for the same game. Before choosing one of the video poker variations in the online casinos, read carefully the guidelines and the pay tables.